I recently received a request to report on OWA for a 2003 Exchange environment. Needless to say without any 3rd party tools you are kind of left in the dark. However, I found the below website that assisted me with pulling some stats from the IIS logs using Log Parser 2.2 and 2 SQL scripts. First browse to this website and follow the instructions. The site will give you 99% of the information you need to pull the reports. There was one issue that they failed to mention though. How do I export the data to CSV??? This article was very helpful and there’s some other commands that you might want to use. Lastly I could not get the 2nd script to work for exporting the data to a pie graph. 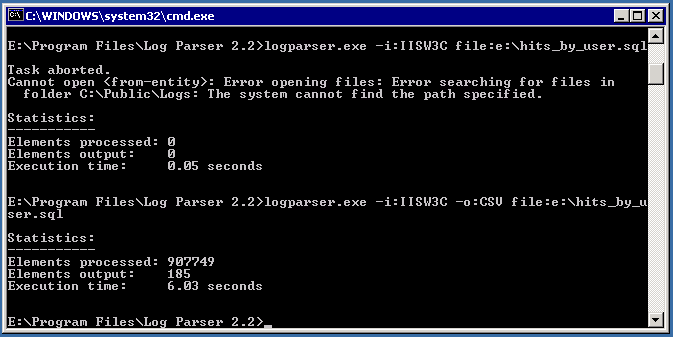 I had a very interesting problem today that I’ve never experienced before with Exchange 2003 and OWA. Some users advised that when in OWA the mail shown is a month old and no new mail is shown in OWA newer than the previous month. All e-mail is visible and accessible in Outlook though. This showed all unread mail but not the results we wanted. I then chose messages again and all mail was shown as we expected it in the first place. All read, unread, most recent and old mail as per the Outlook client was visible. This however is a quick fix and the first time that I’ve personally seen it. I’m sure with some more investigation there will be a patch or config that will resolve this.